Going into this weekend, there wasn’t a more polarizing team in college football than the UCF Knights. While their schedule was repeatedly scrutinized, all they did was win. When they defeated Auburn in the Peach Bowl, fans were quick to dismiss the victory by saying the Tigers weren’t giving their all. Really? And when they blew out Pittsburgh earlier this year, that win was also slammed as if they beat up on another cupcake. Next Saturday, the Panthers take on the second-ranked Clemson Tigers for the ACC championship. When UCF took the field at Raymond James Stadium on Friday afternoon, there was a buzz in the air. A beautiful day for football in Tampa in front of the largest crowd ever in the series. Last year, UCF pulled out a wild 49-42 victory with a kickoff return touchdown in the closing seconds. The fans were certainly ready for another War on I-4. But with any war, there are casualties. And as the Knights headed back to Orlando, they found themselves leaving without their leader, McKenzie Milton. 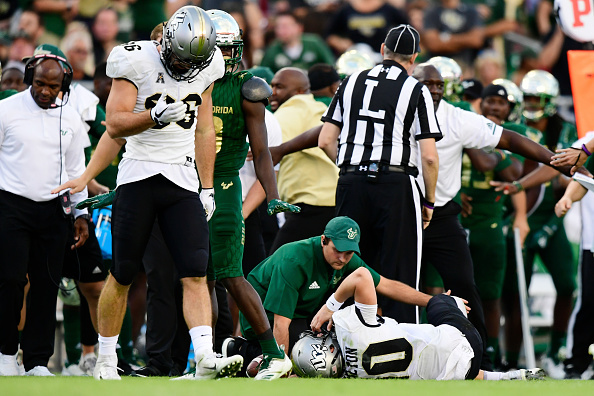 UCF won its 24th consecutive game, 38-10 over USF, but this one felt mostly bittersweet. It was third-and-seven, Milton ran outside the pocket and attempted to race to the sticks. USF cornerback Mazzi Wilkins went low for the tackle and collided with Milton’s knee. While some UCF fans may disagree, it wasn’t dirty. It was unfortunate, but it was football. The severity of the injury is still unknown but you knew from the moment he went down, his season was over. As I’m writing this story, we know he’s undergoing surgery at Tampa General Hospital. Suddenly chants of “We want Bama” or even analyzing UCF’s chances (or lack thereof) to make the College Football Playoff now seem trivial. UCF will now take on Memphis for the chance at another championship....The American Athletic Conference Championship. This will also determine whether or not the Knights advance to a New Year’s Six Bowl Game. If UCF wins its next two games, I don’t think they will be hanging another National Championship banner. They made their point and if the playoff system ever changes is entirely out of their hands. However, I do think it’s time for all of college football to rally around this team. You don’t have to acknowledge them as “National Champions” to recognize their accomplishments. If this is the end of the winning streak, what a ride it has been. After the game, Milton’s replacement Darriel Mack talked about being called into action. How will Mack approach this week? UCF Head Coach Josh Heupel on his reaction to losing his star quarterback. Running back Greg McCrae has 181 yards rushing in the Knights’ victory. He talked about trying to keep it together following McKenzie’s injury.